First identified on November 3, 1988, Phyllis was estimated to be about two to three years old when she started showing up at Blue Spring State Park's warm water refuge. Because of her nice, round shape, she was initially nicknamed "Blimpo” by the park’s rangers. 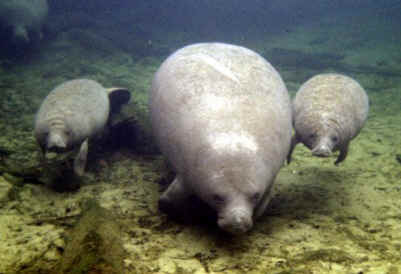 They noticed that she had a similar shape and tail scar as another manatee named Beebe, who was born to Phoebe in the fall of 1985 but then disappeared. Was Blimpo the missing Beebe? No one knows for sure, but the young manatee was eventually christened Phyllis. Phyllis is famous for having given birth to the first recorded twins at Blue Spring State Park. It was the evening of August 19, 1991, and Park Biologist Joe Kenner had observed a mother manatee and her two young calves in nearby Lake Beresford. Twins are unusual for manatees, and there was excitement when the mother manatee was soon identified as Phyllis. “I was hoping Phyllis would have her first calf soon, but I didn’t expect this!” said Wayne Hartley, Manatee Specialist for Save the Manatee Club and a former ranger at Blue Spring. 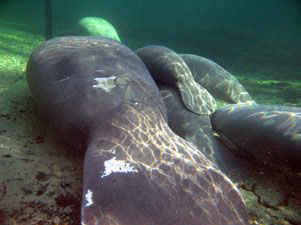 The twins were soon named Bertram and Bartram, after an early manatee researcher and a naturalist who had explored the St. Johns River, which is connected to Blue Spring. To the delight of the park visitors, Phyllis brought her twins with her when she came for the winter, and the trio spent a great part of each day in the spring run. Since that time, Phyllis has had at least 10 other calves and even delivered two of them right at Blue Spring. Her other calves are named Phollie, Pepper, Phire, Phalcon, Pipi, Tonka, Biker, and Blue, who was born in 2009. Her daughter Phalcon has had three calves – including a brand new calf in 2012 – which makes Phyllis a grandmother. In addition, Phyllis will often adopt orphaned calves and let them nurse. This happens with some, but not all, manatee females, and Phyllis has been known to care for up to two calves at a time. Needless to say, she usually has a group of youngsters hanging out with her. A regular visitor to Blue Spring's warm water refuge, Phyllis has earned the title of "attendance champion" more times than any other manatee in the Blue Spring population. That means she is nearly always present when Wayne does his manatee "roll call" each morning in the winter months, and she is sometimes spotted in the summer as well. She is easily recognizable by her large size and the several distinct scars on her back and tail -- most of which were caused by boat hits. Phyllis usually arrives at the park in November and stays until sometime in March, and she has been known to make between 40 and 50 visits to the park. Phyllis was second place attendance champion during the 2009 – 2010 manatee season with 25 recorded visits and overall champ during the 2010 – 2011 season with 26 visits. During that time, she was sighted with Blue, her latest calf, and her usual entourage of juveniles. Wayne thought that Phyllis might be pregnant when she left for the season in March 2012. But when she arrived early last November, she was alone, which was unusual for her. However, it was “probably restful for her” as Wayne noted, as she is normally surrounded by younger manatees. When the temperature of the St. Johns River fell to 57° F at the end of December, the coldest temperature of the season, Phyllis was there, along with 324 other manatees, making use of the 72° F warm water refuge at Blue Spring. Some cool temps in February and March of 2013 also brought Phyllis back to the spring for three visits each during those months. Her last visit was on March 29th, before she ventured out for the summer. Phyllis was recorded as making 14 visits to Blue Spring this season, which was not quite as often as usual, and not enough to win attendance champ this time. She was frequently seen in the company of other adoptees such as Annie, Howie, Georgia, Lily, and Paddy Doyle, among others. During the season, Wayne also captured her on camera, and you can view his underwater video below. 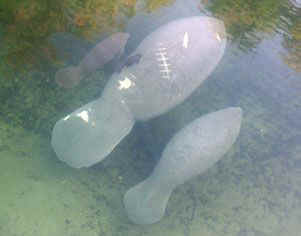 Check our Blue Spring web cam for updates and to see Phyllis and other manatees from the Blue Spring population.